Florida's lieutenant governor resigned and nearly 60 other people were charged in a widening scandal of a purported veterans charity that authorities said Wednesday was a $300 million front for illegal gambling. Lt. Gov. 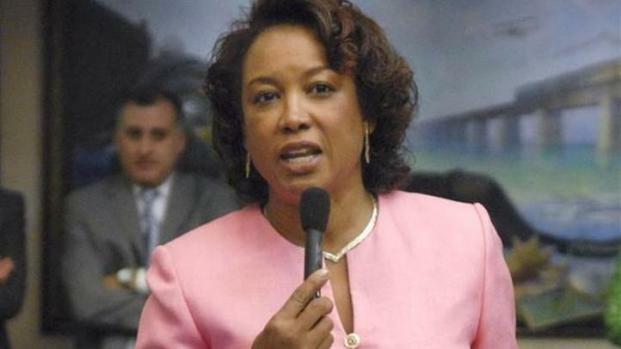 Jennifer Carroll's resignation came a day after she was questioned in the investigation. Her public relations firm did work for the St. Augustine-based charity Allied Veterans of the World, but she has not been accused of wrongdoing. Authorities said the probe involved 57 arrest warrants and 54 search warrants issued at gambling operations in 23 Florida counties and five other states: South Carolina, Georgia, Alabama, Nevada and Pennsylvania. Florida Attorney General Pam Bondi said charges, which will be formally filed next week, include racketeering, conspiracy, money laundering and possession of slot machines. The Lieutenant Governor joins Trina Robinson on Live Miami at 11 following President Obama's Special Report regarding the debt ceiling. "It's callous and it's despicable," Bondi said of the alleged scam, which she said "insults every American who ever wore a military uniform." Authorities refused to discuss any ties between Carroll, a 53-year-old Republican, and the investigation. Her aides had no immediate comment. Carroll, a Navy veteran who served in the Gulf War, appeared in a TV ad in 2011 promoting the organization's charitable work on behalf of veterans and their families. Carroll's resignation letter to Gov. Rick Scott offered no details about her reason for leaving, but the Republican governor said in a statement she resigned so her ties to the company would not be a distraction for the administration. "I will not elaborate on the details of her resignation further, other than to say that she resigned and she made the right decision for the state and her family," Scott said. Allied Veterans evolved from a charitable organization that ran bingo games and held bake sales for veterans beginning in 1979 to a group suspected of operating more than 40 illegal gambling locations around Florida, according to an Internal Revenue Service affidavit. The veterans' charity was a fraud, according to the IRS. An ongoing criminal case against a former top aide to Florida Lt. Gov. Jennifer Carroll is transforming into a swirl of allegations about improper relationships, widespread illegal taping and other incidents inside Carroll's office. NBC 6 spoke with Steve Webster, the attorney for Carletha Cole, who is making some of the allegations. "In an effort to mislead the public into believing that it is not profiting from an illegal gambling enterprise, Allied Veterans and others have engaged in a conspiracy and scheme to defraud," the affidavit said. One of those arrested, Jacksonville attorney Kelly Mathis, is the alleged mastermind of the scheme, authorities said. Mathis allegedly made about $6 million alone from the gambling operation. "She was involved in a company that we know was involved in criminal activity," Scott said. Scott also said: "I'm not gonna talk about the investigation at all, but I have no knowledge that she broke the law." From 2007 to early 2012, investigators found evidence of over $6 million in what appear to be charitable donations by Allied Veterans. That amount, however, was only about 2 percent of the over $290 million made from gambling operations during that time period. Instead of going to veterans, the vast majority of the money went to for-profit companies and the individuals who operated Allied Veterans and its so-called "affiliates." Authorities said they seized about 300 bank accounts containing $64.7 million and assets including such exotic vehicles as Maseratis, Porsches and Ferraris. To play games at one of the Internet cafes, a customer gets a prepaid card and then goes to a computer to play "sweepstakes." The games, with spinning wheels similar to slot machines, have names such as "Captain Cash," ''Lucky Shamrocks" and "Money Bunny," according to the IRS. Winners go back to a cashier with their cards and cash out. The games have been the subject of much debate in Florida and some are legal as long as most of the profits are donated to charity. Each of the locations had a big sign prominently displayed that read: "This is not a gaming establishment." Inside were rows of computers where patrons could play the various games. At most of the sites, employees wore shirts emblazoned with an "Allied Veterans" logo. On the walls were photos of company executives making donations on its behalf and letters of recognition from some of the charities that received donations. In Anadarko, Okla., the owner of International Internet Technologies, which was accused of supplying the cafes with software, was arrested along with his wife. Chase Egan Burns, 37, and his wife, 38-year-old Kristin Burns, faced charges including racketeering and conspiracy in Florida. International Internet Technologies made $63 million from the Florida operation during 2007-2010, according to the IRS affidavit. Burns' wife's role in the company was not immediately clear. Chase Burns was released from the Caddo County jail on a $500,000 bond. He denied any wrongdoing. "What we do is legal," he told The Oklahoman on Monday. Calls to the Burns on Wednesday were not immediately returned. A telephone number listed for Allied Veterans was disconnected. Multiple emails to an address listed on the group's website weren't returned. Former Florida state Rep. Scott Plakon, a Republican, said he filed bills to shut down the gaming sites in 2011 and 2012. "I found that this is gambling, happening right next door to our Publix (grocery store) and dry cleaner and it just didn't seem right," he said. Republican consultant Justin Sayfie said Scott can benefit from Carroll's resignation. "This in some ways, could present him with an opportunity to pick someone who would help him with his re-election campaign," Sayfie said. But Democrats said the scandal can only reflect badly on Scott. "She was never vetted properly. For a top businessman, that's bad business practic," said Mitch Ceasar, Democratic chairman of Broward County. Carroll, an immigrant from Trinidad, served 20 years in the U.S. Navy, working as a jet mechanic before retiring as a lieutenant commander. Elected to the state House in 2003, she's served as deputy majority leader and majority whip. She's also a former executive director of the Florida Department of Veterans' Affairs. She moved to Florida in 1986. A married mother of three, Carroll has a son who plays defensive back for the Miami Dolphins. Carroll was the brunt of late-night talk show hosts last summer after she apologized for offending lesbians when she said black women who engage in those relationships don't look like her. Carroll, who was implying that black lesbians aren't attractive, made the remarks when she was asked about court documents in which a fired staffer claims that she walked in on Carroll and a female travel aide in a compromising position. Carroll denies that claim. The former staffer is charged with violating state law for allegedly giving a recording of a conversation with Carroll's chief of staff to a newspaper reporter.